28.2.1926 - 21.3.2019 Passed away peacefully 93. Loved wife of Sydney (dec). 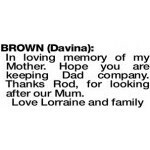 Mother to Lorraine and Rod, mother-in-law to Robert and Jan (dec). Grandmother to Daran, Trevor, Kelly and Rod. Mum has many great grandchildren. So proud to call you our mother. Rest in Peace. 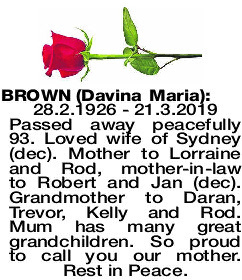 The Funeral Service for Mrs Davina Maria Brown of Mandurah will take place in our Chapel, 2 Leslie Street, Mandurah commencing at 10.30am WEDNESDAY (3.04.2019). Cremation will take place privately at a later time. In loving memory of my Mother. Hope you are keeping Dad company. Thanks Rod, for looking after our Mum.